Argentina’s rich history of 20th and 21st century social, political, and activist movements looms large in popular imagination and scholarly literature alike. Well-known images include the masses gathered in the Plaza de Mayo outside the iconic pink presidential palace during populist President Juan Domingo Perón’s first terms (1946-1955). This scene was imprinted in popular culture, for better or worse, by Andrew Lloyd Webber’s Evita. The Mothers of the Plaza de Mayo famously held weekly demonstrations in the same plaza beginning in 1977 to decry the forced disappearance of their children by a brutal military government. 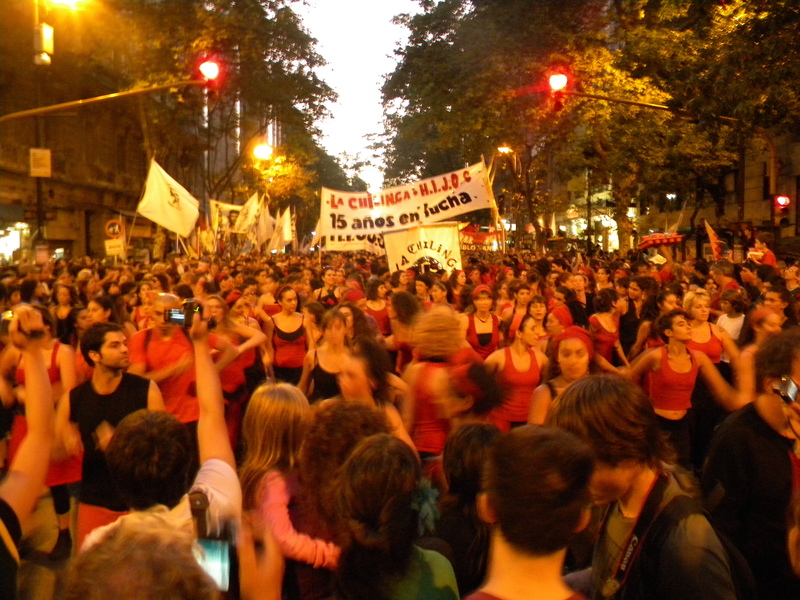 Argentine protest movements continue to make headlines, most recently around feminist issues. Ni una menos (Not One [Woman] Less) is a movement against gender-based violence that has spread across Latin America through the strategic coupling of physical demonstrations with social media-based activism. While artists have a celebrated history of participating in these social and political movements, one community has long been excluded from the story: contemporary dancers. “Contemporary” dance, though difficult to definitively categorize aesthetically or by time period, generally signals practices with some relationship to the Western concert tradition (i.e. ballet and modern dance). While tango is synonymous with dance in Argentina, the country has a long tradition of classical ballet and the earliest modern dance experiments date to the 1940s. Beginning in the 1960s, contemporary dancers began to produce dance works and cultivated creative projects and off-stage activisms that paralleled the political vanguards of the time, particularly following the 1966 military coup that installed General Juan Carlos Onganía’s repressive dictatorship. Susana Zimmermann’s Dance Laboratory (1957-1970), for example, offered an innovative model for dance practice and production that aimed to “create-together-a-new-language-for-a-new-man.” The group’s mission articulated with the revolutionary spirit of the time and protests against the dictatorship. While Zimmermann’s group was not officially affiliated with any political group, their stage works spoke to the political climate in powerful ways. By the early 1970s, militant political groups—particularly armed factions—captured the national imagination and became a major concern for the military government. While the world of concert dance might seem distant from that of armed militancy, contemporary dancers indeed participated in these groups and in some instances put their knowledge of dance to work for the revolutionary cause. Militant dancers formed part of the infamous 1972 prison break at the Rawson Penitentiary in Trelew, an escape that ended tragically with the military’s execution of sixteen political prisoners. For example, choreographer Silvia Hodgers used exercises drawn from her dance training to both ready her comrades for the physical demands of the escape and choreograph their actual exit. Image credit: Oduduwá Danza Afroamericana dancers and volunteers participating in the March 24, 2011 human rights march. Provided by and used with permission of the author. The political struggles that marked the early 1970s culminated in the 1976 coup d’état that began Argentina’s last military dictatorship (1976-1983), a regime responsible for the forced disappearance and murder of an estimated 30,000 citizens. During this dark period, contemporary dance’s political intervention was subtler: it offered a mode of everyday survival. The military dictatorship closely surveilled citizens’ behavior, and Argentines had to make certain that their acts did not associate them with “subversion.” The sense of belonging in dance studios and experience of relative autonomy that they provided offered a life-sustaining respite from the dictatorship’s control. In the years following the dictatorship when Argentina faced the daunting task of grappling with the violence of this period, contemporary dance works delved into this past and helped make visible individual and collective traumas. Works like Silvia Vladimivsky’s tango-inflected The Name, Other Tangos (2006) explored the grief of forced disappearance and echoed the work of human rights groups that fought for justice in the juridical and legislative spheres. When a staggering economic crisis struck Argentina in 2001, the contemporary dance community once again responded. As the working and middle classes took to the streets in protest, contemporary dancers imagined new forms of cooperative labor that challenged traditional ways of making art. Dancers for Life, a community dance group focused on collective creation, formed in 2002 and rehearsed until 2018 in a breadstick factory that was reopened by a labor cooperative following the 2001 crisis. As Argentina once again faces economic uncertainty, new generations of dancers are rethinking the relationship between art and labor politics. The Argentine Association of Dance Workers and the Forum for Dance in Action are two current organizations dedicated to fighting for dancers’ rights as workers in the face of deep government cuts to arts and education funding under conservative President Mauricio Macri. Though contemporary dance’s history of political engagement is far less documented than that of other arts, even a brief overview demonstrates the centrality of this community to legacies of political struggle in Argentina. The political future of Argentina—and Latin America more broadly—of course remains uncertain. The ongoing rise of right-wing governments across the region is linked with the return of neoliberal economics and conservative social policies. The recent election of Jair Bolsonaro in Brazil offers the most recent (and arguably extreme) example of this shift. Contemporary dancers, surely, will continue to find ways to strategically and thoughtfully move through and intervene in these changing political landscapes. Featured image credit: Sunrise, cityscape, drone view and aerial by Andrea Leopardi. Public Domain via Unsplash. Victoria Fortuna is an Assistant Professor in the Dance Department at Reed College in Portland, OR. Her research interests include Latin/x American concert and social dance, dance as a mode of political and community organization, and cultural histories of dance in transnational perspective. 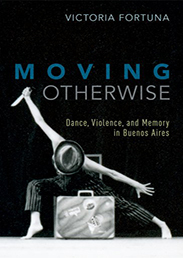 She is the author of Moving Otherwise: Dance, Violence, and Memory in Buenos Aires.